9/34 Dan Krovich Beautiful looking and a fun ride. 19/50 Michael Bentley It's a pretty fun ride, but nowhere near the charm or creativity of the original. 27/46 Les Winan As usual, plenty of fun without a ton of substance. Hard to top 11 but 13 is better than 12. 30/48 Kim Hollis A huge improvement over Ocean's Twelve. It was wise to go back to focusing on the caper. 108/214 Max Braden The third of this series lacks the surprises of the first and the blatant fun of the second. It just seems rote. Terry Benedict warned Danny Ocean and his crew that they should run and hide. He told them in no uncertain terms that no matter where they went, the casino mogul would find them and he would exact his revenge. What North American movie-going audiences failed to appreciate at the time was that Benedict might as well have been speaking directly to them, as the sequel to Ocean’s 11 was a punishment to all involved. Save for one memorable scene with Topher Grace, Ocean’s 12 is universally considered a bust, one of the worst sequels to a great movie since the days of Speed 2: Cruise Control or maybe even The Godfather: Part III. All of the brevity and charm of the re-make of the Rat Pack classic was replaced by senselessly complicated plot lines, an ill-fated story involving Julia Roberts not playing/pretending to be Julia Roberts, and a disastrous denouement involving a man disco-dancing his way through a laser security system. Mistakes were made. Let’s move on. 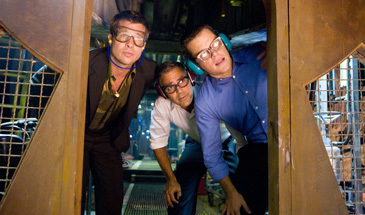 The production of Ocean’s 13 has taken three years to consider what went wrong with the last outing in order to prevent repetition of those errors in judgment. The result is a more personal plot similar to Ocean’s 11. In that film, Danny Ocean (George Clooney) was focused upon winning back the heart of Tess, who was currently seeing the afore-mentioned Terry Benedict (Andy Garcia). The second movie moved away from that such sort of interpersonal dynamic, instead making the miscalculation of having Ocean try to prove to some unknown European thief called Nightfox that he was the best thief in the world. Ocean’s 13 throws out the ego and narcissism and goes back to the formula that works. This time, former Vegas mogul Reuben Tishkoff (Elliott Gould) attempts to get back in the game by starting a new Las Vegas hotel, joining forces with powerful mogul Willy Banks (Al Pacino). As their new enterprise approaches its launch, Banks kicks Tishkoff out of the partnership, directly causing the man to have a heart attack. When Team Ocean finds out what has happened, they attempt to broker a new deal with Banks, but that bit of diplomacy is doomed to failure. With no other palatable options, the master thieves agree that Banks’ new Las Vegas hotel must be hit on opening night, striking a blow for their friend. See the latest developments for this project on the Ocean's Thirteen Movie News page.